We received our tracking number for our SDCC product today. We should, The Great Gear willing, have it in hand just in time to load it all into the Spy Monkey Machine and head down to San Diego this coming Wednesday! So with out further delay we can start sharing exactly what it is we've been cooking up. This is the flip side to our mock card back. It is an homage to one of those popular 5.5" barbarian styled action figure lines of the 80s. There will be no blisters glued to these 4x6" cards. Instead we're including them as an undamaged backdrop display option. Note that sweet cape! We're hand making those. It's the little extras, y'know? Here is the bio for our Deluxe figure. The Deluxe figure will include mock card back, all alternate Weaponeers of Monkaa heads, weapons, and Close Combat Armory set in a matching color scheme. Price for this Deluxe figure is $15 each. The WEAPONEER: Monkaarian Lord of War. His name is Fandar Skarta, the first Monkaarian. Eons ago he arrived though a rift in time/space. From where even he is uncertain. He knows only survival and is haunted by violent memories of war. On this savage new world he has named Monkaa there is cause to practice both each day. The natives of the planet are a harsh, uncivilized, and violent people, the Tribes of Monkaa. Brutal creatures that seem to form from the very elements that make up his strange new home. With his ability to forge, hone, and wield weapons from those same elements, he will tame them, he will control them, he will bend them to his will, he will civilize them. He will rule them! He is THE WEAPONEER! The second figure, The W.O.M.O.M.F.G. 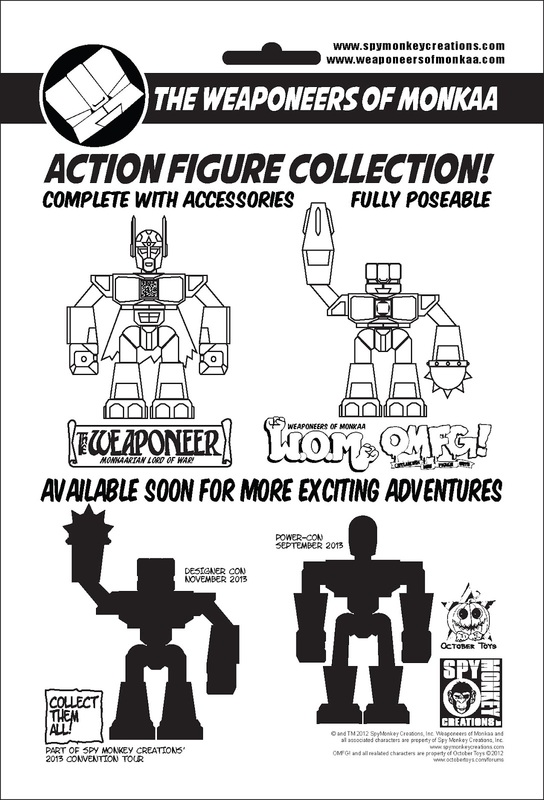 is a collaboration with our awesome booth mates, October Toys. 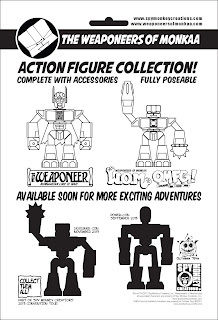 Paying much respect to their popular fan participation and crowd funded OMFG mini-figure line. The W.O.M.O.M.F.G. is molded in the same fleshy toned plastic as those Outlandish Mini Figure Guys. It also includes a mock card back, all alternate Weaponeers of Monkaa heads, weapons, and matching Close Combat Armory set. There is also a special OMFG faction symbol just for this figure. Price for The W.O.M.O.M.F.G. is $12 each. We will also have The Original Weaponeers of Monkaa Armory sets, Close Combat Armory sets, limited stock of some of our most popular Weaponeers of Monkaa figures, and a few surprises. Check back often between now and Tuesday as we'll be revealing more details and photos of everything we will have available at the convention. Remember, we'll be at booth #4951 in the main hall of The San Diego Convention center beginning this coming Wednesday July 17th - Sunday July 21st. Stop by, say hello, and take home these awesome new Weaponeers of Monkaa!